If you are already involved in hiring you would have already experienced that it is not enough for anyone to possess just technical knowledge to be able to find fit for a certain job. There are certain hidden traits in any candidate that needs to be assessed in order for them to perform well in any job. There are certain things that you can make them acquire through training and coaching but you need to know the traits that you need to look for which you cannot impart on them through training but are required to possess in order for them to be able to become a part of the team and contribute to the success of the company or organization. This online hiring course is structured into 10 well-defined chapters, each of them addressing different aspects of the art of hiring. 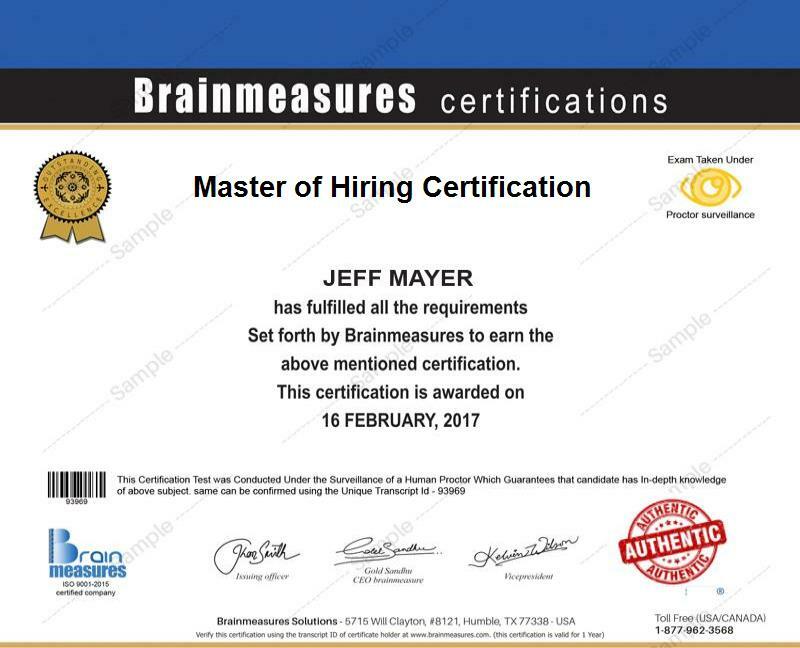 This online hiring certification is all what you need in order to master this art that can have a huge impact on the success of the company. ‘The Basic Four-Question Interview’ and is definitely an interesting read. Matching skills with jobs is the need for such hiring process and chapter 5, ‘Work-Type Profiling: Matching Skills and Interests with Job Needs’ gives you all the necessary details on how to find this match. Anyone involved in hiring knows that the process doesn’t get completed till the candidate finally accepts the offer and joins the company and this is where the next chapter with the title, ‘After the First Interview—How to Make Sure You Have a Great Candidate come in handy’ gives you an insight into how to grab onto your first picks. The next chapter will help you make that final decision on picking from your top choices as it gives you ‘The Ten-Factor Candidate Assessment’. There are factors such as remunerations, bonds, etc. that is also part of the hiring process that involves lots of negotiations between the candidate and the hiring authorities. Chapter 8 ‘Recruiting, Negotiating, and Closing’ will help you to deal with such negotiations better. Chapter 9 ‘Sourcing—How to Find the Best’ will give you an idea of where to look for the right candidates and the final chapter, Chapter 10 ‘Implementing POWER Hiring’ helps you to do the mass recruiting which is a very complicated, elaborate and time-consuming process which becomes messier if a thorough knowledge of different aspects of mass recruiting is not known. Anyone involved in recruiting personnel for your company or organization will benefit from these online certifications. Human resource managers, Chief Executive Officers, Chief Financial Officers, Chief Technical Officers, Top managers or anyone involved in hiring should take up this course. Success of any company or organization will depend hugely on its human resource and if you are able to hire the right people, you can guarantee its success to a certain extent. This online certification which you will receive after passing hiring exam will definitely help in hiring individuals and in power hiring which will bring you more success.